Nicaraguans are commemorating 25 years since left-wing Sandinista guerrillas swept the country's US-backed dictator, General Anastasio Somoza, from power. Ministers, clergy and Sandinista Front members attended a rare ceremony for reconciliation in the capital Managua. Tensions remain over the legacy of the Sandinistas and the US-backed Contra campaign against them in the 1980s. 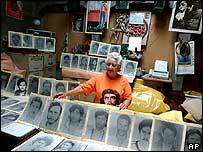 The Sandinistas, who remained in power until 1990, introduced major reforms but deep poverty remains. 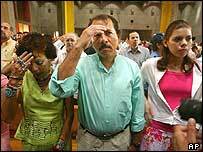 About 1,000 people attended Monday's reconciliation ceremony at Managua's cathedral. It was the first time that the clergy has come together with representatives of the Sandinista Front, along with current members of the cabinet. The head of the Roman Catholic church in Nicaragua, Cardinal Miguel Obando y Bravo - who once denounced the Sandinista Front as a "serpent" - gave a sermon in which he asked for an attitude of forgiveness. Later Daniel Ortega, president from 1979 to 1990 and current head of the Sandinista Front, gave a reading. The BBC's Claire Marshall in Managua says that given the history of animosity between the leftist Sandinistas and the church this mass is being seen as an important step forward. Thousands of people have been arriving on buses from the countryside all day ahead of Monday evening's remembrance party in Managua's main square - once called Revolution Plaza, today the Plaza of the Republic. Our correspondent adds that the atmosphere feels genuinely reconciliatory, and many youngsters are in the crowds. On 19 July 1979, thousands of Nicaraguans gathered in the square upon hearing news of the fall of the Somoza dynasty, which had ruled the country with American support since 1937. The success of the Sandinista National Liberation Front (FSLN) was greeted as a heroic revolution by some; for others, it was seen as giving communists a dangerous toehold in Central America. US President Ronald Reagan, who took office in 1981, was convinced that the Sandinistas' victory could spark revolution throughout the region and threaten the security of the United States. He allocated funds to train and organise Contra guerrillas who battled the Sandinistas for much of the 1980s in a civil war that left thousands dead. During their time in power, the Sandinistas established the roots of a democracy. They also introduced extensive literacy and vaccination programmes. Ailsa Henderson, a worker for aid agency Christian Aid in the country, says the revolution markedly improved conditions for Nicaragua's poor - and that life would have been much worse without it. But observers say neither the Sandinistas nor the right-wing parties who succeeded them in office have really been able to tackle poverty or improve Nicaragua's dire economic situation. "Thousands from all over Nicaragua have made the journey here... to join in these celebrations"